The Brothers was a long running series about a family in the road haulage business. There were 8 series in all, going out between 1970 and 1976, including 92 x 50 min episodes. The final series was directed by Mary Ridge, and produced by Bill Sellars. 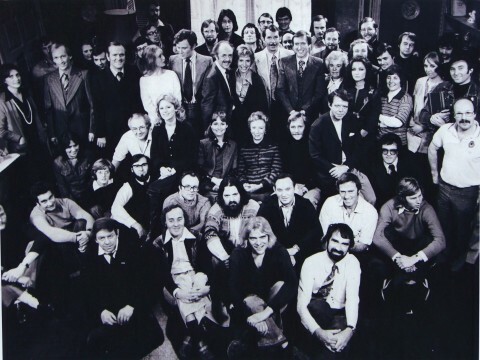 The drama starred Jean Anderson as Mary Hammond, Richard Easton as Brian Hammond, Robin Chadwick as David Hammond, Jennifer Wilson as Jennifer Kingsley, Derek Benfield as Bill Riley, Margaret Ashcroft as Gwen Riley, Patrick O’Connell as Edward Hammond, Colin Baker as Merroney, Carole Mowlan as Claire Miller, and Kate O’Mara as Jane Maxwell. It was a hosted drama at BBC Pebble Mill. The final series was recorded at Pebble Mill, I’m not sure if any of the earlier ones were – please add a comment, if you can give more information. Lynda Kettle was the production designer http://www.lynda-kettle.com and make up artist Maggie Thomas also worked on the series. As far as I am aware most of the 92 episodes of The Brothers were recorded at Pebble Mill Studios.